Billy Joe Saunders has been warned that his dreams of facing the winner of Canelo Alvarez v Gennady Golovkin will be ruined by the desire of Avtandil Khurtsidze. 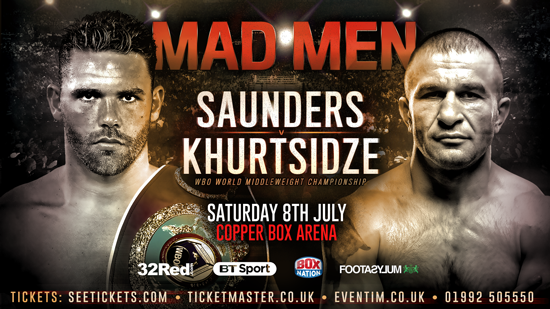 Undefeated Saunders, 27, makes the second defence his WBO Middleweight title against the colourful Georgian at London’s Copper Box Arena on July 8, live on BT Sport and BoxNation. 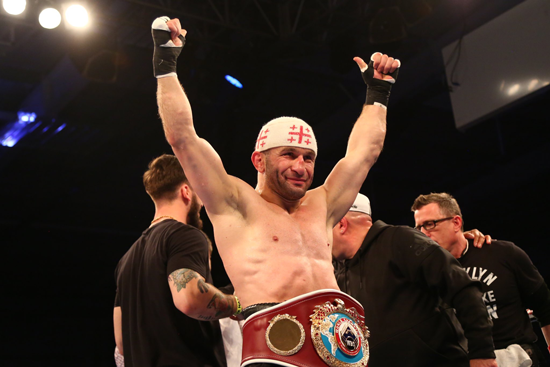 Khurtsidze sealed his status as mandatory contender for the Hatfield traveller’s World crown with a fifth round win over Tommy Langford in Leicester on April 30. It was his sixth consecutive KO win since moving to Brooklyn and signing with Lou DiBella, one of the World’s leading promoters. Saunders narrowly beat another DiBella boxer Artur Akavov in December and the New York promoter believes the Briton faces an even tougher night against Khurtsidze who has won 33 of his 37 fights. DiBella said: “Billy Joe is a very skilled fighter, but you never know which Billy Joe is going to show up. “The fight with Akavov was a close, competitive fight. No one predicted that and Billy Joe hasn’t looked the best of himself in a long time. “The one thing about Khurtsidze is that he’s hungrier than Billy Joe, he’s relentless with his attacks and capable of doing damage at any stage of the fight. “Khurtsidze could be down by four or five rounds and still mount offensive attacks that could win him the fight. World Middleweight Champion against the victor. Saunders had hoped to face Golovkin instead of ‘interim’ WBO champ Khurtsidze, but the fight fell through when the Kazakh signed to face Canelo. DiBella added: “I don’t think missing out on the Golovkin fight will affect Billy Joe. He knows the importance of this fight. “If he does beat Khurtsidze there is a big, big money fight there for him.